OPMEDIC Group is a corporation that provides a broad range of professional fertility and genetic services (through the PROCREA Clinics division), sperm freezing services (through its wholly-owned subsidiary, PROCREA Cryopreservation Center) and surgical and endoscopic services and facilities for clients and surgeons (through the OPMEDIC division). OPMEDIC’s mission is to offer clients in Canada a new and improved way to gain access to surgical services. Since January 2017, the OPMEDIC clinic has been working in partnership with the public network of the province of Quebec as part of an experimental project to provide surgical services outside of hospital facilities. This project aims to reduce waiting list times for surgery and digestive endoscopies. The OPMEDIC clinic also offers cosmetic and male infertility surgical services. With its state-of-the-art facilities and equipment, coupled with its experienced management team and industry-leading medical expertise, OPMEDIC is able to offer its clients unparalleled and highly personalized care. PROCREA Clinics provides a wide variety of fertility treatments and testing services. Fertility treatments include an initial consultation during which couples having difficulty conceiving undergo thorough examinations and testing to determine the cause of infertility. These tests allow the physician to make a diagnosis and propose therapeutic solutions. 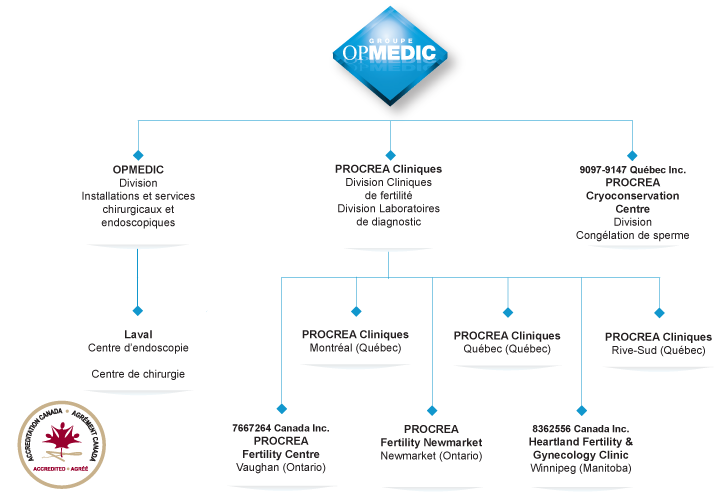 PROCREA Clinics is one of Canada’s leading fertility centres, with locations in Montreal, Quebec City, Vaughn, Ontario (operating under PROCREA Fertility Centre) and Winnipeg, Manitoba (90% owned subsidiary). It provides a broad spectrum of professional services in the field of fertility and human genetics, which are available to anyone wishing to use medically assisted methods to conceive a child. PROCREA Clinics also offers diagnostic services including prenatal screening (Combitest®), which are cytogenic tests designed to improve healthcare and facilitate prenatal screening. These tests can be performed on peripheral blood, amniotic fluid and bone marrow. It also provides other cytology and genetic testing services. PROCREA Cryopreservation has one of the largest sperm banks in Canada. Its cryopreservation facilities comply with strict Health Canada standards for safe sperm samples. The sperm bank also offers a sperm preservation service for men who are scheduled to undergo medical treatments that may affect their fertility (such as chemotherapy, radiotherapy or surgery).